Dr. Kowalewski conducted by Jim Myers in 1986. CINCINNATI—On June 23, 2015, The University of Cincinnati Board of Trustees approved renaming the Health Professions Building as Joseph F. Kowalewski Hall in honor of the former dean of the university’s pharmacy school. Kowalewski served as dean of the College of Pharmacy from 1949 to 1970. He was the last dean of the school when it was the Cincinnati College of Pharmacy, an independent pharmacy school which first opened in 1850. 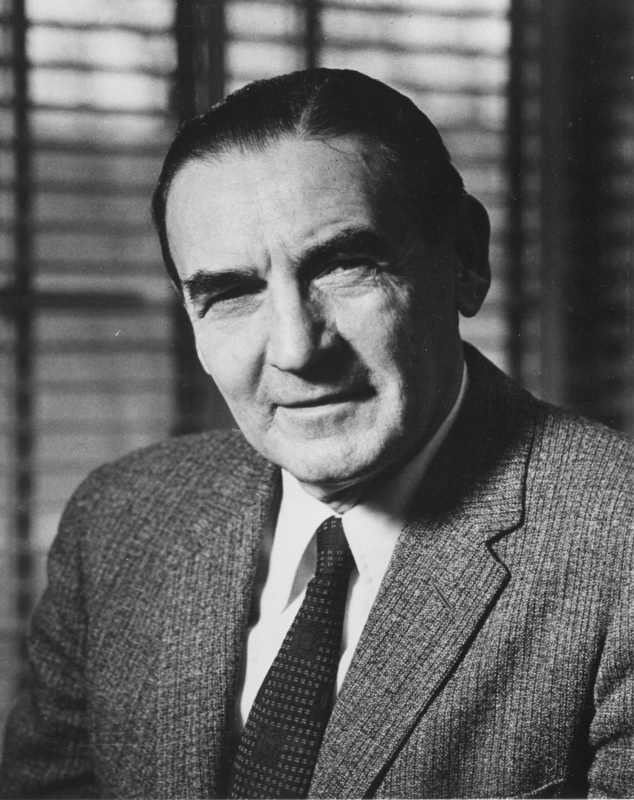 Kowalewski also directed the merger of the school with the University of Cincinnati in 1954 to become the university’s 13th college. The college was renamed the James L. Winkle College of Pharmacy in 2007. Cincinnati College of Pharmacy. At one time located at 423 W. Eight Street, Cincinnati. This photograph serves as a link to a map of the site as it exists today. Kowalewski died at age 100 on March 30, 2000. Born in Missouri and raised in Wisconsin, Kowalewski received a teacher-principal’s certificate from the Normal School of La Crosse, which is now the University of Wisconsin-La Crosse. He later earned a bachelor’s degree in chemistry from the University of Chicago and a master’s degree in chemistry and doctorate in physical chemistry from the University of Cincinnati. This photograph serves as a link to more photographs of the interior of the building prior to demolition in 1974. From 1931 to 1941, Kowalewski taught chemistry on a part-time basis at the Cincinnati College of Pharmacy while working on his doctorate, which he received in 1938. He was later appointed director of research at Sperti, Inc. in Cincinnati where he worked developing cosmetics, detergents, food products and pottery glazes. He also oversaw the development of Preparation H® and is credited with coining the name for the product. Kowalewski returned to the Cincinnati College of Pharmacy in the fall of 1949 as dean. When he became dean, the college was in significant financial trouble and was facing the loss of accreditation from the Accreditation Council for Pharmacy Education (ACPE). Affectionately known around the college as “Dean Joe,” Kowalewski improved the school’s finances while also raising a substantial endowment from alumni and local business leaders. The college moved onto the UC campus in July 1954 from its previous home at 423 W. Eighth St. and a year later secured ACPE accreditation. 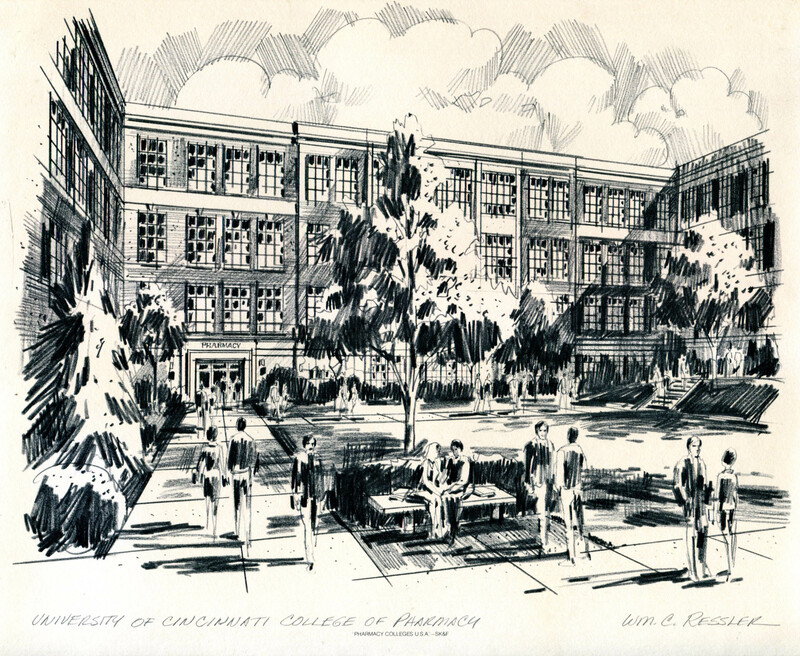 Sketch by William C. Ressler: The University of Cincinnati College of Pharmacy. 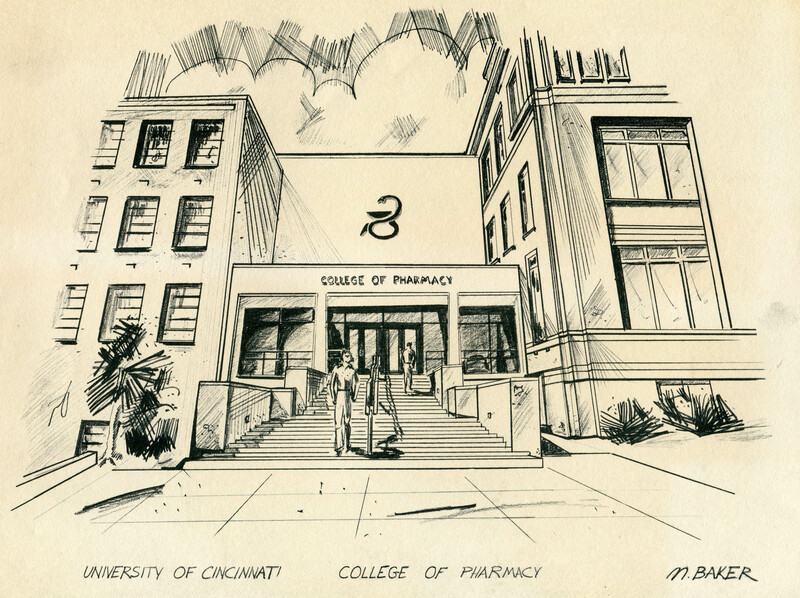 Sketch-print by M. Baker: The University of Cincinnati (Winkle) College of Pharmacy. UC began a major renovation of the 118,590-square-foot Kowalewski Hall last year. Renovations will include new laboratories and replacement of the building’s heating, ventilation, air conditioning and plumbing systems. Electrical and lighting systems also will be upgraded and made energy efficient. All windows in the building will be replaced. The building’s original auditorium, which has been used in recent years as office space, will be restored to its original use. The building was designed by famed Cincinnati architectural firm Samuel Hannaford & Sons. It opened Feb. 25, 1918, as the new home of the Ohio-Miami Medical College, which at the time served as the medial department of the University of Cincinnati and is now known as the UC College of Medicine. The College of Pharmacy relocated from the University’s main campus to Wherry Hall and parts of the Health Professions Building, which are adjacent, in 1976. This photograph serves as a link to the finding aid for the Winkler Center’s collection on the College of Pharmacy. For more information, please call 558-5120 or email chhp@uc.edu.